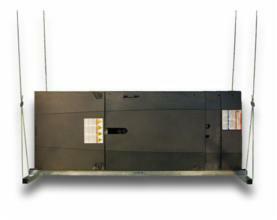 HUNG-RITE, HVAC Equipment Hanger, For HVAC, 5 ton Capacity, Bolts Included, 78 in L x 30 in W The Hung-Rite HVAC Equipment Hanger is a fully assembled HVAC equipment support unit capable of holding up to a five ton air handler, or a furnace and coil set weighing up to 400 lbs. Unbox, unfold, make your holes, and hang it rite. Have that unit installed in as little as 15 minutes! The hanger utilizes cable locks for quick leveling and is equipped with a 3½" bolt for suspension in a variety of places. Hung-Rite’s Hanger gives proper support to eliminate equipment buckling and leaves equipment unobstructed for future maintenance. Pre-drilled holes are located on the arms, for threaded rod during your commercial installations.